LNA Access enables distributors to submit licensing and appointment requests and producer information transactions. This video tour shows you how to submit a new appointment request. Watch from start to finish or use navigation tabs to select a topic. The Producer Management Portal allows Distributors to quickly find Producer training course completion information and real-time point-of-sale training authorizations using a front end screen. Click the image to launch this video tour. Watch from start to finish or use navigation tabs to select topic. DTCC Insurance Profile is a repository of expense, fee, and commission schedule data provided by carriers for annuities distributors to access from a centralized location. This guide provides instructions for carriers. 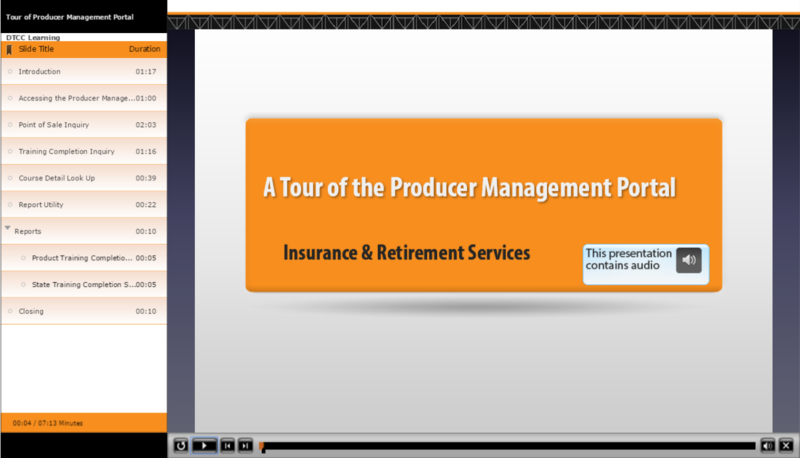 This guide is intended to show distributors how to use the Insurance Profile Web interface. As a distributor, you will be able to: •Access Product CUSIP level standard commission data •Export commission schedule data in a spreadsheet •Access Product CUSIP level standard fee and expense data, and •Export a fee and expense summary report. DTCC's Insurance & Retirement Services (I&RS) offers a suite of streamlined processing and compliance-driven solutions for carriers and their distribution partners -- broker/dealers, banks, brokerage general agencies, independent broker/dealers and other firms -- through a secure, centralized and automated infrastructure. This infrastructure enables insurance carriers and distributors to exchange information at various points throughout the annuity and life insurance processing cycle. DTCC Insurance Profile (IPF): DTCC Insurance Profile is a repository of expense, fee, and commission schedule data provided by carriers for annuities distributors to access from a centralized location. Licensing & Appointments (LNA): Automates and standardizes the two-way flow of information needed to manage producer information between carriers and distributors, eliminating paper and simplifying data exchange. LNA Access: Gives distributors and carriers access capabilities in the full LNA Service and works as an online data entry request and confirmation reporting tool. Commissions (COM): Transmits commission information from carriers to distributors for insurance products, providing same-day money settlement. Producer Management Portal (PMP): Provides a comprehensive source for centralizing, sharing, tracking & verifying producer training completions. State & product training & source for authorizations for annuity sales. 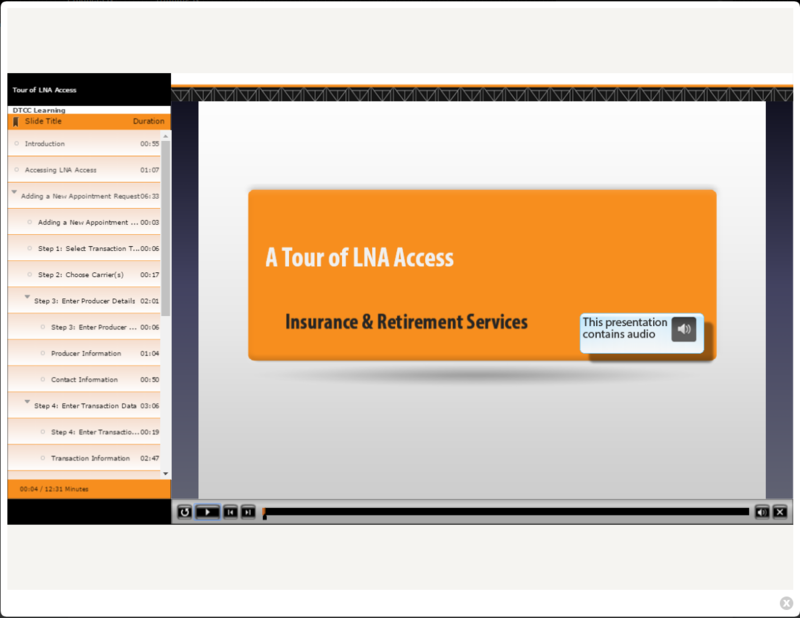 LNA Access enables distributors to submit licensing and appointment requests and producer information transactions. Applications & Premium (APP): Transmits annuity application and initial premium information from distributors to carriers. The service provides an efficient, straight-through process for annuity applications and initial premium payments, incorporating same-day money settlement. Attachments (ATT): Enables insurance distributors and carriers to electronically exchange digital (imaged) documents, signatures, forms and other types of unstructured data during the pre-sale, new business and post-issue processing of annuity and life insurance information. Attachments Access: Is a non-integrated/standalone online data-entry tool that allow senders to electronically send digital (imaged) documents, signatures, forms and other types of unstructured data during the pre-sale, new business and post-issue processing of annuity and life insurance information. Asset Pricing (AAP): Enables carriers to transmit the net values for underlying funds within variable annuity and life insurance products to distributors on a daily basis. The AAP file provides fund-level pricing information, similar to the net asset value for mutual funds, which may be applicable to multiple insurance products within a carrier’s product line. Financial Activity Reporting (FAR): Enables carriers to provide distributors with daily annuity and life insurance financial transition information, giving them a comprehensive and accurate picture of client accounts and helping them supervise and manage those accounts. ACATS/IPS (Automated Customer Acct. Transfers-Insurance Processing Svs.) automates changes in annuities’ broker/dealer of record when clients transfer accounts between brokerage firms. Subsequent Premium (SUB): transmits subsequent annuity premium information from distributors to carriers along with same-day money settlement of subsequent premium payments. Registered Representative (REP): Facilitates changes of the registered representative within the managing firm requested by the distributor when the representative leaves the firm, retires or when a customer account is transitioned to another agent. Broker Identification (BIN): Facilitates brokerage identification number/brokerage account number changes requested by a distributor. IFT Access: A standalone application that gives distributors and carriers direct access to capabilities in the full IFT (REP/BIN) service and works as an online data entry request & confirmation reporting tool. Settlement Processing for Insurance (STL): Automates settlement of post-issue money & funding activities between carrier & distributor including withdrawals, partial surrenders & mandatory distributions back to a client’s brokerage account. Settlement for Replacements automates the money settlement of 1035 exchanges between carriers. Arrangements (ACORD 107 message) is a one time change to a service feature on an insurance contract. Arrangements can consist of the following programs such as Systematic Withdrawals, Dollar Cost Averaging, Automatic Payments, Asset Allocation, etc. Death Notification (ACORD 810 message) provides the insurance carrier with a notification that a death has occurred to one or more parties to the in force/active policy or contract. Financial Withdrawals (ACORD 105 message) is a one time full or partial redemption of funds from an insurance contract. Fund Transfer (ACORD 102 message) is a direct exchange or on-time reallocation of the underlying funds within a variable insurance asset. This request includes modifications to the service features affected by the exchange. Policy Administration (ACORD 113 message) provides a defined set of changes to an in force/active policy or contract. This message supports both party and communication changes. Values Inquiry (ACORD 212 message) is used to return various policy values for a specific in force/active policy or contract. The Values Inquiry transaction begins the Financial Withdrawals, Fund Transfers, and Arrangements transaction messages. Policy Administrative Inquiry (ACORD 115 message) is used to obtain the policy information needed specifically to perform basic policy administration activities. This message allows the Distributor or Vendor Platform to gather necessary information about an in force/active policy to determine the administrative changes that are allowed. The Policy Administrative Inquiry transaction begins a Policy Administration transaction message. IFT Access allows Distributors to submit brokerage identification number (BIN) or representative of record (REP) changes. This welcome video gives you a brief description of the learning assets in the I&RS Membership section. Is there a CUSIP Profile user guide? Click CUSIP Profile Guide to access the guide on the CUSIP Information page. What user roles are available for distributors? Distributors have access to browse carrier CUSIP information. How do I find out who my super access coordinator (SAC) is? What is the CUSIP Profile Online Tool? The CUSIP Profile Online Tool is a web services application. It allows carriers to add, update, delete, upload, browse, and view the history of their CUSIP information directly within a stored CUSIP database. How do I get access to the web applications? Use the Product Request Form to complete the service “add” for all web products. Sub Fund ID = the last 5 bytes, which can further define the fixed fund within the contract. How do I add/remove a service? Firms can use the Product Request Form to add or delete an I&RS service. How do I add/remove CUSIPs? Insurance Carriers can use the CUSIP Profile online tool to add, modify, or delete product CUSIPs from DTCC’s insurance masterfile. The CUSIP Information guide contains procedures for using this tool. For a dedicated circuit, you can use DSL, broadband, your own ISP, or another dedicated circuit as your backup options. Do I need a backup line? Yes. DTCC requires that you have a backup line to connect. You cannot use ANIRA, the Web Portal, or the Internet as a backup to a dedicated circuit. Can I test the line before onboarding? No. You cannot test the line before onboarding because the required backup line and broadband are not in place until onboarding is complete. Do I need membership approval before establishing connectivity? You can request setup of a dedicated line before you have membership approval. However, DTCC does not allow clients to go live, even in PSE, before membership approval. All other connectivity has to wait until membership approval. How long does it take to establish connectivity? Dedicated connectivity takes about two months. ANIRA takes about two weeks. What is the fee structure for the various connectivity options? See the SMART Fee Guide for specifics and up-to-date information. What are my connectivity options? See the Implementation Guide for details on connectivity options. How long does the membership application approval process take? The DTCC Solutions Insurance membership application process can take up to four weeks for completion and approval. This period applies after receipt of all required membership documentation. Other factors in the approval process vary for each candidate, so timing can be longer or shorter depending on the results of the review. What are the next steps after uploading all documents in the portal? The Account Administration representative reviews the documents to ensure that they are correct on completion. If all documents are in good order, the Anti-Money Laundering/Know Your Customer (AML/KYC) team reviews the information provided. How much does it cost for a DTCC Solutions LLC Insurance Data Service Only membership? There is no cost to apply for membership. Can an individual apply for membership instead of a company? DTCC accepts applications from duly formed legal entities only, not from individuals. What products does DTCC I&RS offer? 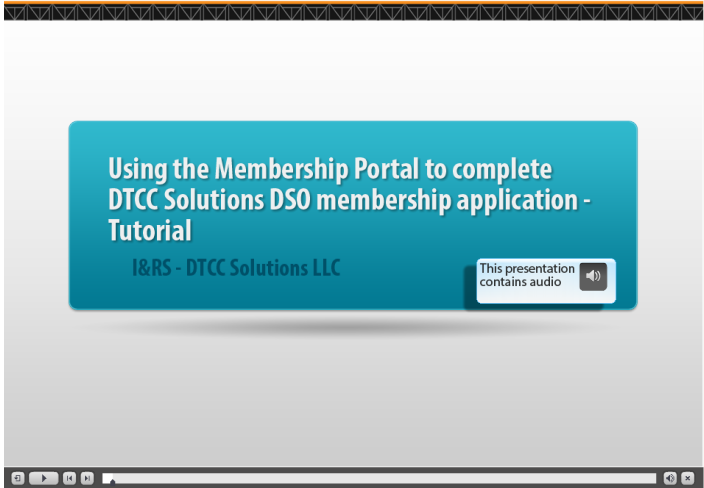 See the DTCC website for a list of all DTCC I&RS products. How does DTCC process files on holidays? DTCC follows the New York Stock Exchange holiday schedule in addition to two bank holidays (Columbus Day and Veterans Day). See the Holiday Schedule for details processing rules for these holidays. Where can I find DTCC's holiday schedule? Click here to access DTCC’s holiday schedule. What is the file transmission processing schedule for I&RS? Files transmission times vary by I&RS service. See Transmission Processing Time Information in the Technical Support Center for more details. How do I add or remove myself to/from a contact list? What are the services fees for I&RS products? Can I estimate my bill? The Fee Schedule page on the DTCC page lists service fees. Use the I&RS Fee Calculator to estimate costs. What do I do to get to a secure portion of the website? Contact your relationship manager for credentials to access the secure portion of the website. Where can I find a client contact list? Refer to the Member Contact information page. How do I get to a secure portion of the website? How do I contact the DTCC customer center? What gets processed on bank holidays? Refer to the Holiday Schedule for specifics. What products am I set up to use? How long can DTCC retransmit files that it previously sent to my firm? DTCC can retransmit outbound files up to ten business days after the original transmission. Are there sample files available? The Record Layouts page of the I&RS website contains MSD and MSS files. Where can I find standard usage by service? Refer to the Standard Usage page. How do I complete a merger, acquisition or organization change? How do I add additional memberships to my existing membership at DTCC? How long does the NSCC Limited Membership application approval process take? The NSCC Limited Membership application process varies, but completion and approval can take an average of three (3) months. This time line assumes that the applicant has supplied all required membership documentation in good form to initiate the review. Other factors involved in the membership approval process can vary for each candidate. These factors can include legal entity ownership information, financial and capital requirements, and legal opinion reviews. What NSCC membership types can process insurance products? Contact your relationship manager to ensure you choose the correct membership and begin that process. Does DTCC require a clearing fund in order to use insurance products? No. However, some memberships that have insurance functions, such as MF/IS, require a clearing fund as a result of other product capabilities. How much does it cost to use the services under NSCC Limited Membership? The Fee Schedule page on the DTCC website lists service fees. Use the I&RS Fee Calculator to estimate your costs. How much does it cost to apply to NSCC Limited Membership? DTCC does not charge a fee to apply for membership. Do I need regulatory approval to apply? Some NSCC Membership types that allow for insurance products, such as MF/IS, do require primary regulator approval, particularly if these legal entities are regulated broker-dealers. DTCC highly encourages companies to have regulatory approval before engaging our organization. However, although other factors are relevant, DTCC is willing to review applications on a case-by-case basis, as long as regulatory approval is imminent. This review is subject to the applicant meeting any other conditions DTCC deems necessary for the particular membership type. Can an individual apply instead of a Company? DTCC only accepts applications from duly-formed legal entities, not from individuals. How do I become a DTCC member in order to use Insurance products? If your firm is interested in becoming a member, answer a series of basic questions using the Prequalification Wizard. After you answer these questions, a DTCC Relationship Manager will contact you for additional details and to determine the right membership for you. You will then receive the application requirements for membership you need. How do I provision operator access to a colleague? Log in to the portal website (https://portal.dtcc.com). In the DTCC Portal, click the “Insurance & Retirement Services Learning Center” link under Documentation to open the I&RS Learning Center in a new window. Under Membership, select I&RS Access Coordinators to access the I&RS Super Access Coordinator Guide and supporting simulations. 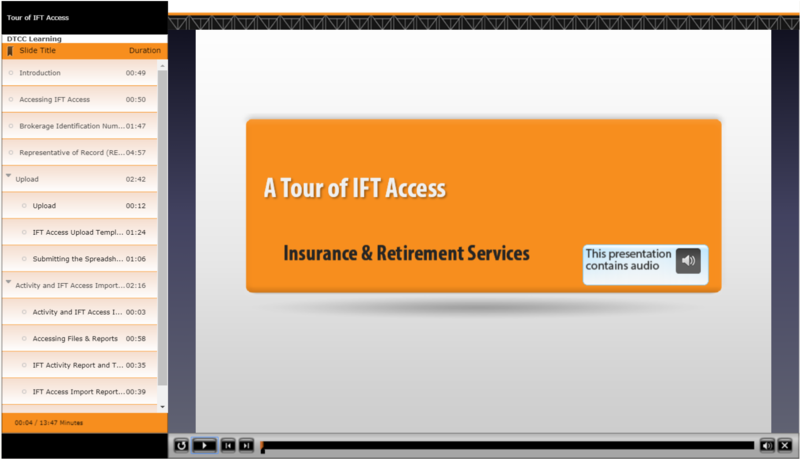 Clicking the learning center link opens a new window and gives you access to the full I&RS Learning Center. It does not log you out of the DTCC Portal. Access to the full I&RS Learning Center without logging in through the DTCC Portal requires registration for the learning center. How do I know who my Super Access Coordinator (SAC) is? The portal website lists your company’s SACs. Log in to the portal (https://portal.dtcc.com). Click the “Click here to find Access Coordinators at your company” link on the far right side of the page. I do not see all of my account numbers under my user ID. What do I do? I do not know what roles/accounts/O-codes to provision to my own or my colleagues’ access. I tried to create a user, but it states a profile exists. If I try to search for the profile, nothing comes up. If your company has multiple legal entities with DTCC, it is possible that the user you created has an existing login ID under a different entity. Because you can only view users under your own entity, you cannot see their profiles. In these instances, create an ID using an alternate username. It is not necessary for usernames to match their email addresses. How do I provision operator access to myself? What is the difference between a Super AC and an AC? ACs (Access Coordinators) can create/delete/modify Operators. Super ACs can create/delete/modify Operators, ACs, and other Super ACs (with verification from a second Super AC). I received my computer registration code, but do not see a link where I can input it. Close ALL of your browser windows and log in again. The link to input your registration code appears after you log in. I did not receive a certificate download code when I got system access. Either contact your company’s designated Super AC or call the Client Support Center at 888-382-2721, option 1-3. Have your user ID available when you call. I need a new computer registration code, but the system is not emailing it to me. I registered my computer, but when I try to log back in and launch my application, it does not recognize my computer. Call the Client Support Center at 888-382-2721, option 1-3, and have your user ID available when you call. I am a regular user (operator) and I want to update my account’s email address. Log in to the portal (https://portal.dtcc.com), and click the “My Profile” link on the far right side of the page to update your email address. I clicked the "Click here to find Access Coordinators at your company” link. However, I do not see myself listed even though I am a Super AC. You do not appear as your own Super AC on this list. I logged in, but only see CRS (Customer Registration System). I clicked the "Forgot Password" option, but am receiving an error. What do I do? I am not able to log in. Who do I contact? What is the website address for log in? The website address for DTCC Portal is https://portal.dtcc.com. What is the largest file size that I can send as an attachment? 36 MB is the largest recommended file size. The suggested total number of documents to include in the file is 6 (6 x 6 mb). Where can I find additional web services documentation? The Technical Support Center contains all web services documentation. Why did my response message reject? DTCC sends a reject response with the reason for the error. You can also view the reject response on the Messaging Dashboard using the DTCC Portal. How do I begin connectivity for web services? Consult Record Layouts for more information. How often do the passwords expire on the authentication of inbound to DTCC web message? I sent a message to DTCC and do not see it on the Messaging Dashboard. What does it mean and what do I do? If you do not see the message on the Messaging Dashboard, then DTCC never received the message. Investigate your connectivity and XML message structure to ensure proper delivery of messages. How can I send myself a message to test connectivity in Test and Production? The “Send Message” function on the Messaging Dashboard facilitates the ability to send a pre-defined request message to the customer’s destination URL on record. The pre-defined message is for testing connectivity only. These pre-defined messages do not always pass schema validation when attempted for processing. Who can I test with? Trading partners who are active or ready to become active with the web services product can coordinate testing between themselves. For alternative testing methods, contact your relationship manager. How long does it take to become active with web services? The amount of time depends on the timing and accuracy for receiving the necessary information to become active with an I&RS web services product. The time is also dependent on the participant’s expertise with web services connectivity and XML messaging. If it receives all information in a timely manner and the information is accurate, DTCC can complete setup within ten business days. Where can I see more detail about my failed message? The Messaging Dashboard lists web services transactions that do not pass the I&RS validation. You can see your request message reason for failure through this Portal application. I&RS web services processing also provides a response message or resend request message transaction to the sender of the request. If the transaction does not pass validation, these messages contain additional information. Why is my message failing to pass the I&RS validations? In many cases, the message is failing and not passing the schema rules. Self-check that your message is passing the schema validation before sending the message to I&RS for processing. DTCC provides the same schema to customers as it uses for message validation. Also check the business rules, normally documented in the product’s implementation guide or data dictionary. What is the Messaging Dashboard and how do I access it? 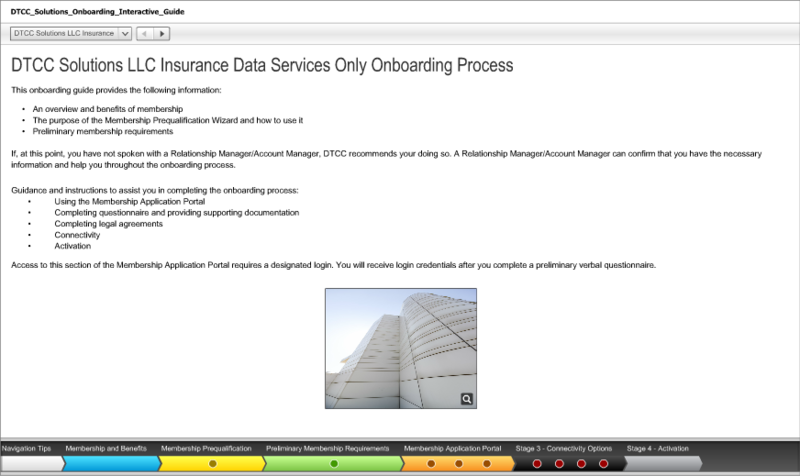 The Messaging Dashboard is a web application available from the DTCC Portal. It allows web service customers to view the latest I&RS processing status of their own messages transmitted through any of the I&RS web service applications. In addition, the Messaging Dashboard facilitates sending a ‘canned web service message’ for testing customer connectivity. Each customer’s Super Access Coordinator (SAC) has authority and entitlements to offer their employees access to the Message Dashboard. How do I troubleshoot timeout conditions? Why am I getting a timeout message and what do I have to do to resolve it? DTCC could not connect to the customer's server to complete the 'request' message transmission successfully. DTCC has successfully transmitted a 'request' message to the customer's server, but I&RS did not successfully receive the expected 'response' message from the customer's server. Make sure that the service is up and running. My digital certificate is within 4 weeks of expiring or I plan to change certificates. Who do I tell and when? Who do I contact with questions? What information do I need when I contact DTCC for help?